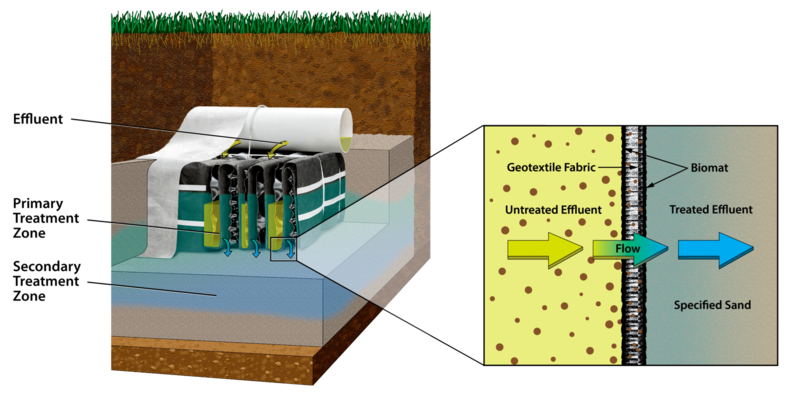 The Eljen GSF (Geotextile Sand Filter) is an alternative for onsite septic leachfield systems. Independent and third party testing is used to assess and confirm the GSF's performance under a variety of conditions. Each GSF Module is made up of a geotextile fabric and a plastic core material that work together to provide vertical surface area and oxygen transfer. The GSF System applies treated effluent to the soil, increasing the soil's long-term acceptance rate. A Specified Sand layer provides additional filtration, and prevents saturated conditions. Perforated pipe is centered above the GSF Module to distribute septic effluent over and into corrugations created by the plastic core of the GSF Module. The GSF Module's unique design provides increased surface area for biological treatment of nutrients and contaminants. 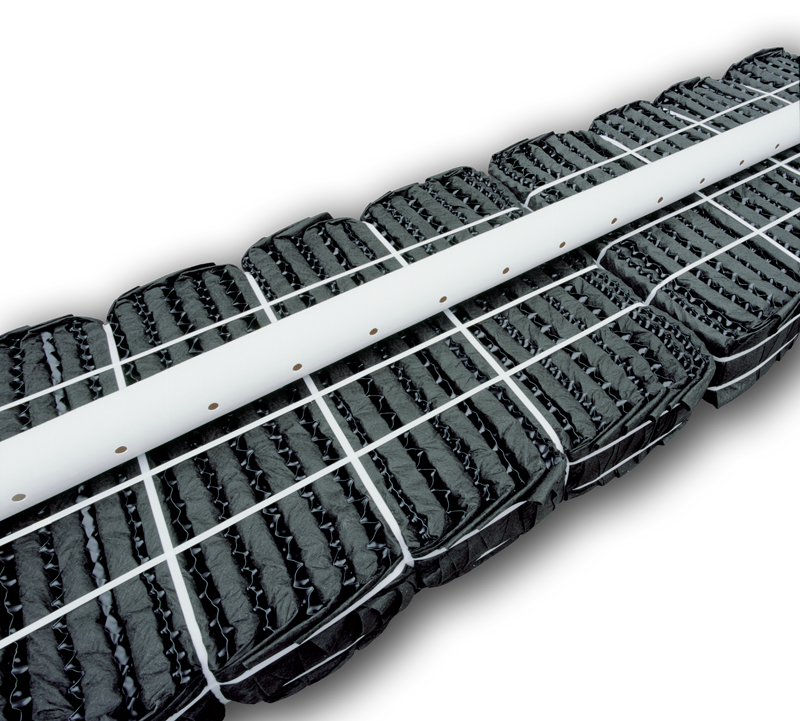 Open air channels within the GSF Module support aerobic bacterial growth on the Module's geotextile fabric interface, and promotes oxygen in the system. 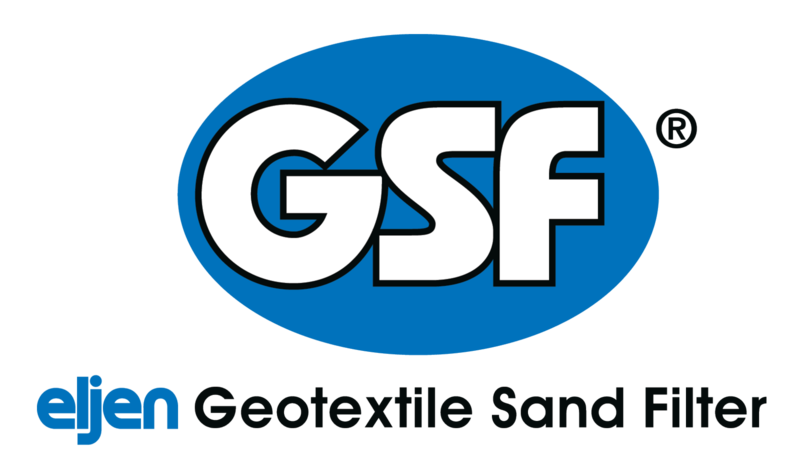 An anti-siltation geotextile fabric covers the top and sides of the GSF Module to protect the system from the migration of fines. The GSF Module provides biomat management, and takes the burden of treatment and biomat development off of the native soil. Effluent drips into the Specified Sand layer and supports unsaturated flow into the native soil. The Specified Sand layer also protects the soil from compaction and helps maintain cracks and crevices in the soil. Native soil provides final filtration and allows for groundwater recharge.